The issue with stress is that is too often dismissed. Stress is one of nature’s contraceptives and can have a dramatic effect on healthy reproduction. The major stress hormone, cortisol, is derived from progesterone, the primary source of the reproductive hormones testosterone and estrogen. Cortisol is like a long-term form of adrenaline, produced in the adrenal gland when the body is under pressure. Most active people suffer for some form of adrenal fatigue due to pushing their limits for too long. This is particularly true of the successful "power-couple," so often seeking help for infertility. Women need estrogen to grow follicles in the ovaries and to produce the endometrial lining in the uterus. 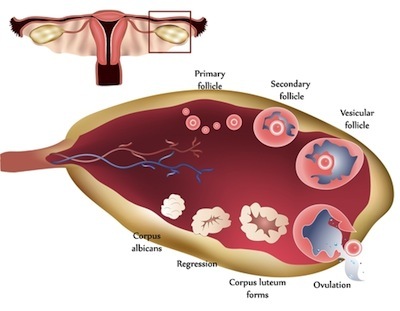 The maturation and subsequent viability of the ovum inside the follicle is also dependent on the correct amount of estrogen production at the beginning of the menstrual cycle. Because estrogen is derived from progesterone via testosterone, there needs to be adequate amounts of progesterone available to make estrogen in the first half of the menstrual cycle. Men and woman need testosterone to produce the eggs and sperm. Testosterone converts to estrogen in the follicle; this process is called aromatization. Testosterone has to be present for the full 72-day production process of sperm. When stress is stealing all the progesterone, neither estrogen or testosterone can be in adequate supply consistently enough to support healthy reproductive tissue growth. If stress is dominant and the body is running on permanent cortisol overload, it is like running on a credit card that is starting to max out. In this perceptive crisis state, the body has to make a call to sacrifice the progesterone to cortisol instead of testosterone and estrogen. The body feels staying alive is more important than reproducing and therefore fertility takes second place to stress. The only time non-human animals make cortisol is when they are starving to death or in captivity. These chronic cortisol-producing states of stress cause the animals not to reproduce at these times. Humans are able to mimic these chronic stress states even if they are not starving to death or in captivity (although many of us feel we are in captivity due to work and lifestyle demands), but are under pressure from not eating correctly or not getting enough rest. Diets high in stimulants and sugar are capable of driving cortisol levels and in turn stealing reproductive hormones. Most people do not get adequate sleep and have to wake up with a cortisol boost in order to get going; though stimulants like sugar and coffee may help to get the system going from an energy point of view, the effect on fertility is detrimental. Do not underestimate the effects of the drain on your reproductive system by chronic stress. This does not mean the occasional bad day or worries about your fertility, but rather the long-term high demand on your resources. If your body deems you to be in energy debt, it is less likely to feel prepared for pregnancy.